Snail, and The Simple Linear Plot. Despite being an enthusiastic, if erratic gardener, I’ve always had a sneaking affection for snails. It’s not just their shells, which are actually far more decorative and varied than seems necessary, I like the delicate elegance of their antenna, and I’m fascinated by the way they move about. Out walking on damp mornings, I find them crossing the slick tarmac lane. Sometimes I anthropomorphize them. Why did the snail cross the road? Are they fearless, or just oblivious? I’ve often stopped to move them onto the verge. It’s a quiet lane. I wonder what I shall say if someone sees what I’m up to? This is despite the fact that at this time of year, when I’m trying to raise a veg garden, the battle between me and the various gastropods turns epic. In one night, a sneaky squadron of six slugs turned the leaves of my four young courgette plants to lace, and lacerated the stems either on the way to or from their feast. My tolerance doesn’t stretch that far. I found them skulking under a potato plant nearby. Don’t tell Dad, who tried to teach me that there’s no place for sentiment in gardening, but I launched them over the fence into the field. There’s a lush headland of weeds there that ought to keep them happily fed, if they can overcome their homing instinct. Yes, snails do have one, (so I assume slugs share it) it was proved in the radio 4 great snail-expirement in 2010. Apart from anything else, I was glad to discover that I’m not the only gardener who’s too soft-hearted to extinguish them. Why else would someone have set out to prove that they return again and again? My gran kept a giant slug in a pot on the garden wall, when I was little. She called it George and said that he was the biggest she’d ever seen. That could have been just for entertainment, or to teach us about gardens. I like to think there was an element of affection involved, that eventually she released him into the wild, rather than ended his life in a salt bath. It’s far too late to ask, but I thought of her when I turned the bathroom light on the other evening and discovered an uninvited visitor travelling across the window sill. After I’d taken a few pictures (well, it’s a talking point, isn’t it? ), I un-suckered my mollusc from the tiles, took it out to the hedge and hurled it into that patch where the others had been sent. Next night Snail, the same one, surely, was back. 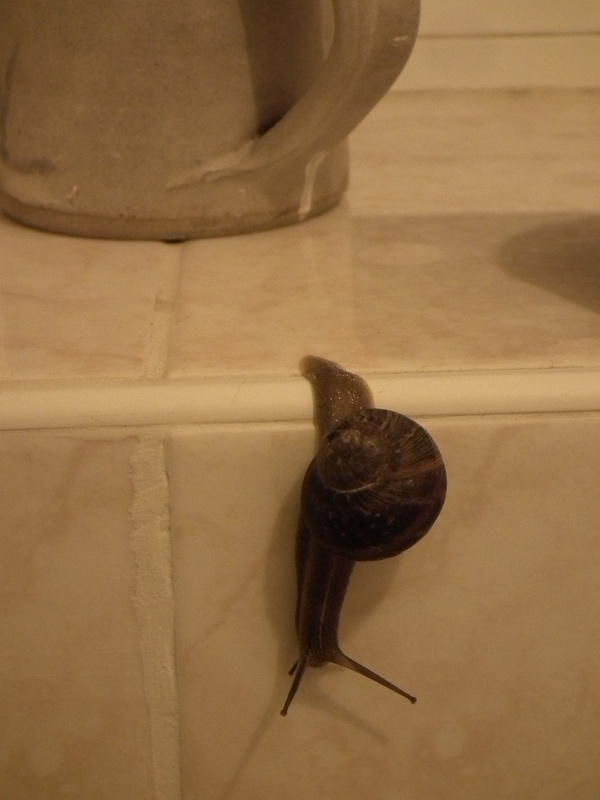 This time Snail had made it past the windowsill and was heading down the wall to the bath. I’m too well versed in linear plotting to take this lightly. In making a second attempt, after overcoming my first obstacle, Snail had achieved the status of PROTAGONIST. Something big was required, something that would leapfrog the story to its third and climatic stage, and have an outcome that was good for me, the ANTAGONIST. If Snail got the happy ending it was intent on, then one evening I might find tens of freshly hatched snails traversing my bathroom tiles. So I took Snail on a hike to a woodland glade, about half a mile down the road. It’s well supplied with tasty flowers and leaves, sunshine, dappled shade, and plenty of protective cover from predators. It’s surely a snail des-res. I wonder if I’ll feature in the epic stories Snail will recount to all the hatchling snails as a benevolent giant, or an indomitable ogre…Either way, I didn’t give Snail chance to lay a trail of breadcrumbs or pebbles. I’ll be keeping close watch on that bathroom window, but I don’t think Snail will be back. It’s occurred to me that travelling up a wall, a pane of glass and over the window-ledge could be counted as Snail’s first obstacle, and therefore all three plot points have been achieved. This entry was posted in creative writing, Linear Plots, plots, Story, The Short Story and tagged creative writing, Creativity, inspiration, plots, Snail, story, structure, The Simple Linear Plot, writing by cath. Bookmark the permalink. Snails yes….but slugs, no. They always have to be the bad guy. Excepting George, please. Even allowing for a child’s view, he was enormous. Fabulous images here Cath. Love the idea of you surreptitiously escorting snails onto the verge. And then working out an explanation in case you are spotted. George sounds a character. As does your Granny. Patricia Highsmith famously kept snails as pets. We can only assume she wasn’t a gardener! I’m also reminded of the slug invasion in the kitchen of Sandhurst St. Sparked a few ribald missives as I recall. Do you? Can you believe I don’t? How tantalizing. You’ll have to stir my memories a little with some hints. Re Grannies, I think we both reaped the benefits of time spent with eccentric elders, I also had several wonderfully idiosyncratic aunts, and feel honour bound to uphold that tradition for my family…it doesn’t seem to take much effort. Loved this! I have exactly the same difficulties with snails not with slugs though. I collect them in a bucket and then take them on a walk down to the canal and liberate them there after giving them a good telling off. The canal sounds like a much more suitable habitat. Are any of them the edible Roman snail, I wonder? We don’t have them in this patch of Gloucester, but I assume being bigger, the potential damage is phenomenal.